Feng-Shui Manifestation Program - Life Quest® Formulas, Inc.
A Manifestation Program that is specifically designed for Feng Shui. A Manifestation Program that is specifically designed for Feng Shui. Run as many operations as you want simultaneously and decide for the Feng Shui energy or energies and the location(s) where to send these energies. 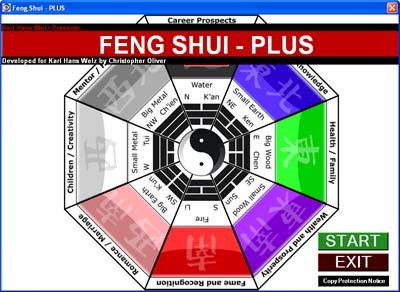 Work with the Feng Shui Bagua or with the floor plan of a location. You can work with up to 12 positions. This Feng Shui Energy Projection and Manifestation Program has been developed by Karl Hans Welz in 2005 as a first in known history. Each program comes with its own Chi transfer diagram. A Chi radionics device is required to use this software.